The court heard that Kirrie Wratten, wife of Dr. Wratten and a co-director of his company Market House Ltd, had entered the café posing as a supporter in order to spy on the occupiers; giving a donation and signing their petition. This was described by the judge as 'foolish'. One of Wratten's many plans for Broadway Market was a 200 hundred seat theatre and in an interview with the Evening Standard Mrs Wratten said "I would have had a role in it as a guest director". Since that particular application has been withdrawn her short appearance at Francesca's is likely to be her first and last theatrical appearance on Broadway (Market). Wratten can now go to court again for an eviction warrant although this could take several weeks and an appeal may be launched before the 23rd December. Francesca's has been successfully defended against eviction three times in the past, so even if it goes ahead this should not be taken as a sign of defeat. The police have re-opened criminal investigations into the original property sell-offs, and the council is reviewing the planning permission for Francesca's, having admitted there are serious questions to be answered and referring it to Independent Planning Directorate for review. Tony Platia, who has run Francesca's for 30 years, isn't the only person in Broadway Market facing this treatment. Spirit, from the Nutritious Food Gallery, 74 Broadway Market, handed a cheque for a deposit on his shop to estate agents Nelson Bakewell on the day it was being auctioned off by Hackney Council, and at the end of the day discovered it had been sold to Bahamas based "Broadway Investments Hackney" for £15000 less than he'd offered. Little Georgia, part of the first wave of gentrification on the street, was recently priced out by Wratten and replaced one week later by a French bistro. Broadway Market, and Hackney in general, is at the sharp end of gentrification in London. It is likely to have six City Academies within the next couple of years, out of a total of only two hundred across the UK. Nearby Laburnum primary school was closed recently and will be replaced by a City Academy in 2006, to be sponsored and run by Swiss investment bank UBS. UBS also sponsors Hidden Art Hackney, which happens to have a significant presence in Broadway Market and has contributed to its redevelopment in terms of providing studio and retail space to 'designer makers' and developing the Saturday 'Farmers STYLE Market'. As Londoners prepare for a heavy council tax bill to pay for the Olympics, which will be focused above all on Hackney, Haggerston Pool, five minutes walk from Francesca's, and Clissold Leisure centre in Stoke Newington remain closed. East Marsh, part of historic Hackney Marshes and a major centre for Sunday football will be turned into a carpark for 2012. It's unlikely that the olympics will provide significant improvements for people living in Hackney and the other affected boroughs, but developers and the construction industry stand to make a killing. The corruption and sell offs on Broadway Market and the rapid gentrification of inner cities around the UK is one of the most visible signs of the continuing decomposition of the working class under New Labour. Along with the mass sell-offs of council housing, highest ever levels of consumer debt, casualisation at work, the pensions crisis and many more symptoms of recent capitalist development, this constitutes a sustained and continuing attack on our living and working conditions which may lead to many more stories like Francesca's. The occupation on Broadway Market provides a glimpse of the potential for resistance against the encroachment of capital and commodity society on our public space and free time. Although a handful of experienced political activists are involved, the overwhelming majority of people drinking tea each day in Francesca's "haven't done anything like this before" (letter to Hackney Gazette, Thursday 9th December). Although highly localised and borne out of the daily experience of life for people in and around Broadway Market, the occupation has been extremely visible in both local and national media and mobilised the support of hundreds of people in the area. 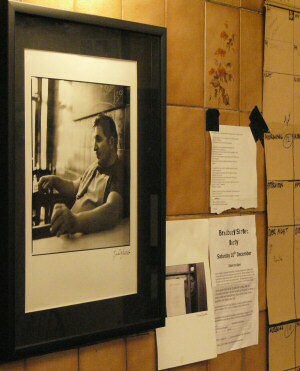 Although the fate of Tony Platia's café is far from decided, the relationships and experiences that are developing through this occupation should lead to a political climate in Hackney which can continue to resist the process of gentrification and social exclusion which is likely to accelerate as 2012 approaches. As struggles like this circulate around the country and internationally, it points towards the potential for a society where people have taken control of their lives collectively, with human need being at the basis of organisation rather than 'market forces'.